Credit card processing is critical for any consumer oriented business. Streamlining the handling of credit card authorizations and settlements can reduce costs considerably, especially for chains. I have implemented a centralized credit card processing system for Red Roof Inns, an American motel chain with more than 300 properties. When a credit card is swiped at a motel the information is transmitted to their corporate headquarters where the authorization is obtained from Visanet and returned to the PMS system at the property. 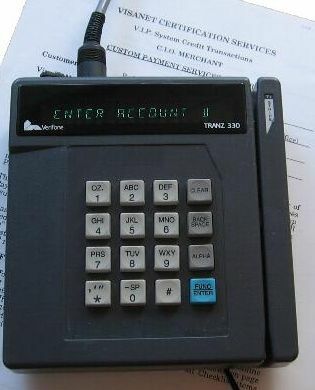 The device for swiping the credit card is capable of obtaining an authorization through a dial-up line if the network connection to HQ is down. In the process of implementing this credit card system I have also done the Visanet certification for Red Roof Inns.